This course will deepen the understanding and application of concepts introduced in Urban Sketching 1 with the particular accent on visual story telling. We will focus on capturing energy and spirit of a place in the style and tradition of graphic reportage. Students will be encouraged to push the boundaries of traditional composition, applying ink and advanced watercolor techniques to capture life as it happens in front of their eyes. We will turn our attention to busy urban scenes such as street fairs and markets, learn how to sketch moving subjects and crowds, explore advanced concepts in perspective, work on achieving the illusion of depth, and create multilayered panoramic drawings. Ultimately, we will cultivate our inner journalist to tell Portlands stories in sketches. 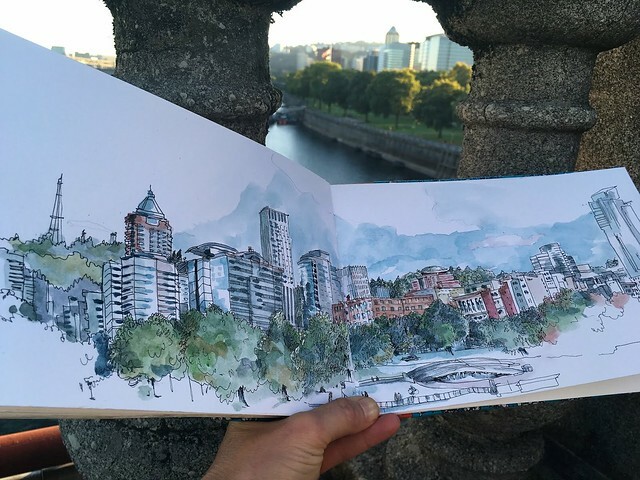 Urban Sketchers is the international community of artists who show their world one drawing at a time and share their work online through blogs and social media channels. From drawing on Brazilian favelas in Rio de Janeiro to detailing Hindu celebrations in the temples of Singapore I have happily trotted the world documenting its wonders in my many sketchbooks. My sketching passion has often led me on a quest for finding sketch-worthy subjects anywhere from the driest desert in the world, to Bangkok street markets, to the daily life in my hometown of Portland. Drawing is my therapy, my passion, and my refuge. It is my way of experiencing and communicating with the world around me. I have presented lectures on sketching around the world inspiring my audiences to cultivate the lifelong passion for visual story telling. My work has been featured in solo and group expositions around Portland. I hold a B.A. degree in Psychology and Art, an M.A. in Linguistics, and a Masters in Interface Design from The Elisava School of Design in Barcelona. When not sketching I am a busy designer, parent, tango dancer and a tango pianist. I am one of the contributing authors in Petes Scullys Creative Sketching Workshop book.